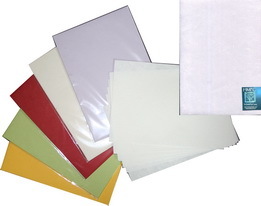 "A4 Sheets (21x29.5cm), set of 10 sheets 80gsm"
non toxic. Bubblejet and Laserprinter compatible. For available colours please click thumbnailCustomized colours and packing are possible on request. 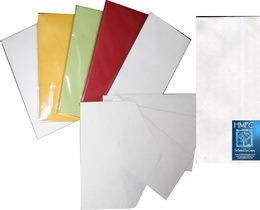 "Envelopes DIN 22x11cm, set of 10 "
"Envelopes Kozo plain colour, 16x12cm, set of 10 "
non toxic. For available colours please go to handmade paper, Kozo plain colourCustomized colours and packing are possible on request. MOQ applies." 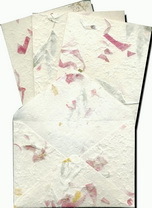 "Envelopes Kozo floral, 16x12cm, set of 10 "
non toxic. 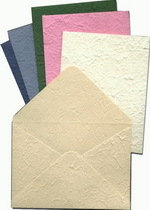 For available colours please go to handmade paper, Kozo floweredCustomized colours and packing are possible on request. MOQ applies."